Just a typical day. I wanted to take a picture of my messy desk while working on our Java core program on a virtual machine. That was my pin board on the left side. Some notes I wanted to remember, some quotes I needed to see. On my desk were my water bottle, mug, sticky notes, papers, notebooks, earphone and computer. On the top side were my non-office-related-stuffs just to let me know that there are still other things in life than what I do now. Whew?! A souvenir Palawan tumbler I got from my friend Jhoy, a wooden Bangui windmill I bought in Ilocos Norte, and a 3D pop out puzzle Christmas gift I received from Sir Borj. A regular day it is! 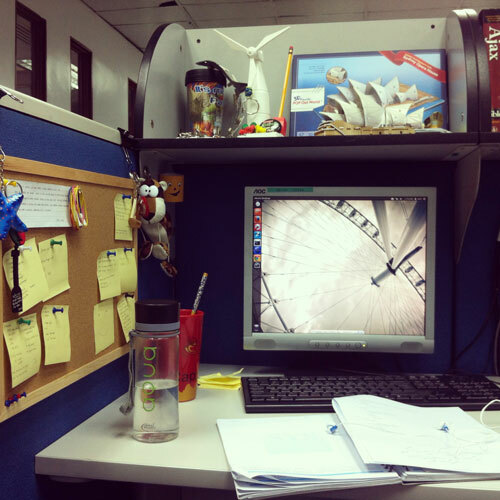 This entry was posted in Daily Me and tagged cubicle, desk, office, work. Bookmark the permalink.